Today was the day we were to get up early before the warmth of the day set in and add a another box to the bee hive stack in order to give them more room to expand. We lost last year’s bees due to the bear attack to the hives and so there were not enough of the poor workers to make it over the winter. We purchased a new bee crew this spring and they have been busier than we ever got to see last year’s bunch, so we were needing to add another layer for them to expand into. Our plan was that the bees would be quiet and docile in the early morning chill of the mountain air. So, I got up at near dawn, made coffee for the hubby and set out the supplies that I felt we would need: the smoker, another screen top (they were building combs in the current one and I wasn’t sure if we would need to replace it or not), the comb extractor so we could check for larvae and the queen being productive, and bee suit. The sun was just making it across the yard to where the hive is situated, so I felt I had better awake Ted now before it started warming up too much. Ted is not a morning person. There are those who wake up and run out to greet the day, but Ted’s morning is more of a wait and see approach. He has to have coffee with a sweet first while motionless at the counter, a little moving around with maybe a walk to the mailbox with the dog to make sure the blood is flowing, more coffee while looking over his computer and whatever nonsense is happening in the world, another confection or slice of bread, trip to the bathroom, get dressed, then possibly some breakfast. I was asking him to bypass all but the first coffee, get dressed and lets get the bee’s done. He grumpily layed on the couch in the kitchen (I have a 26 foot kitchen, so yep there is room for a couch in there) and said it was too early and this wasn’t his routine. I let him know he could go back to bed, but if we wanted to take advantage of the early chill, he needed to giddy up. 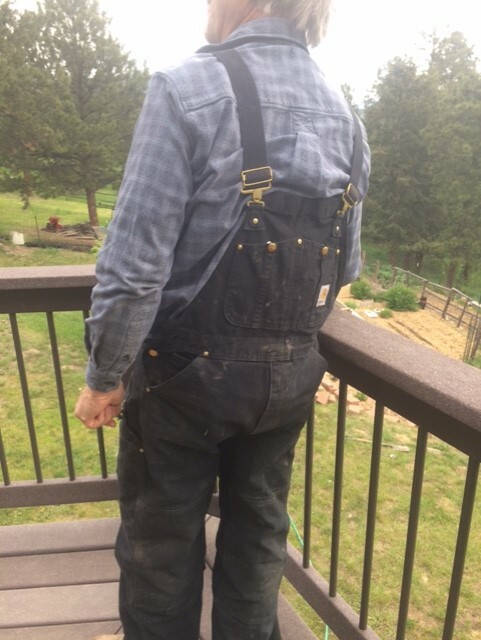 So he slogged down the stairs and since he has been stung though some of his work pants he has with holes in them, he swapped out for a rugged pair of Carhartt bibs. I could hear him struggling when I journeyed down the stairs and he flung the strap over his shoulder with disgust and asked me if I could at least hook up the suspenders since he was having a hard time of it this morning. I stood behind him and burst out in loud guffaw as he had the bibs on backwards. “Dude, you cant reach the clip because you have them on backwards! Just take them off and turn them around!” He didn’t care. He wasn’t about to expend any more of his limited early morning energy and just wanted them snapped in the back if that’s what it took to keep them up. So I buckled up his bibs and we got the bees taken care of. It feels like it’s always a bit of a rush when we do anything with the bees so that we are not wanting to irritate them for any longer than necessary. He was then awake and with adrenaline from being around 10,000 bees, he was ready for breakfast which we ate in peace on the deck with the early morning sun on our faces. 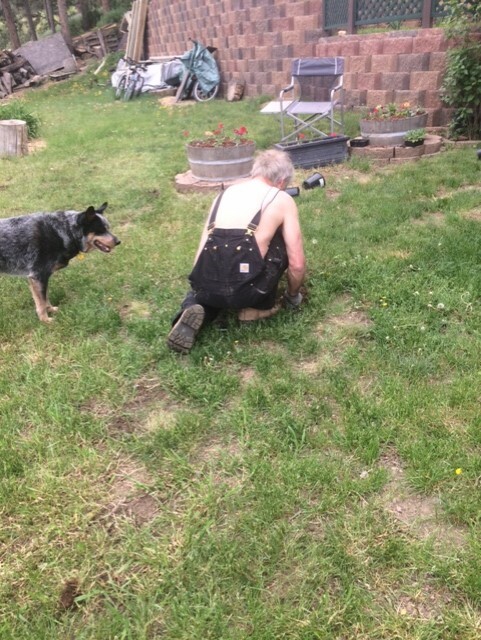 One would have thought that if planning on working in the yard all day in said bibs, that he would then take them off and put them on correctly, but No. I’ve always known that my husband does not act his age, but today I decided he was just being a five year old who isn’t concerned if he is dressed properly. It just didn’t matter in his world. Later when the sun came out and he got hot, he didn’t change into something lighter either. True to his inner 5 year old of the day, he just took off the shirt and left the pants on backwards. I mean that isn’t even red neck style! Maybe he should be in the next Carhartt commercial showing just how comfy their work clothes are. At least there were no tantrums to go with his 5 year old phase today. And he wore them most of the day complaining only once that it sucked to have to take down the bibs to pee. No sympathy from a woman for that. Still shaking my head here.